"A nice, light, healthy summertime dinner. 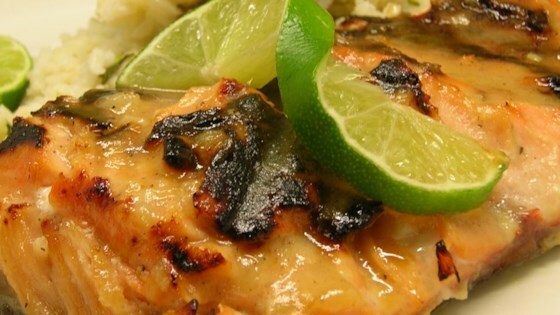 Salmon is marinated in a lime and honey mixture. And anytime I add lime to a dish, I want a margarita the size of my head to go with it!" Place salmon fillets in a 9x13 inch baking dish. In a small bowl, stir together the lime juice, honey, brown sugar, and olive oil. Pour over the salmon. Cover and refrigerate for 30 minutes to marinate. Preheat the oven to 450 degrees F (220 degrees C). Season the salmon with salt and pepper. Bake for 15 minutes in the center of the preheated oven, or until fish flakes easily with a fork. Garnish with lime slices, and serve immediately. Hands down my favorite salmon recipe. The lime juice and the honey cut through the richness of the salmon and make it very light and fresh tasting. This was yummy! It was very light tasting and easy to make. I had to replace the orange blossom honey with clover honey. Either way it I will still be cooking this one again.